Driven by consumer demand for non-chemical solutions to their health needs, companies are pushing hard to develop products that look at alternative approaches to both calming consumers and ensuring a long and quality sleep experience. Consumers’ decision to turn to OTC products. to get a good night’s sleep is inexorably tied to stress levels. As many organizations, such as the American Psychological Association, have shown time and again, disrupted sleep impedes the body’s ability to process the stressors of daily life in a healthy way, which in turn further disrupts the sleep cycle and creates a negative feedback loop. more difficult to break the longer it persists. As consumers’ lives become busier and more stressful, especially in more industrialized countries like the United States, there has been higher reported levels of stress among the consumer base. This has directly contributed to the increase in sales of stress management products and OTC sleep aids, both pharmaceutical (such as P&G’s ZzzQuil) and herbal (such as Nested Naturals’ LUNA), as consumers try to break the stress/sleep cycle. The overlapping markets for stress and sleep management mean the most successful products are positioned for both conditions. 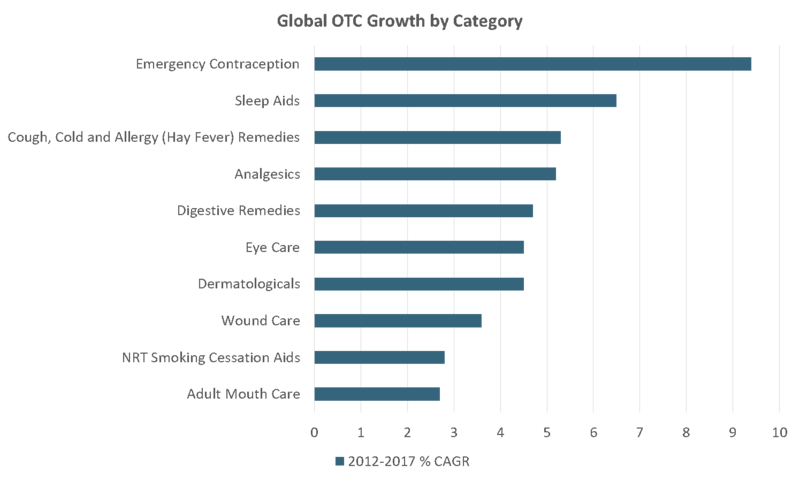 Like other categories in the OTC space, sales of sleep aids are also driven by demographic factors like urbanization and the growing population of consumers in later life, defined as being 65 years or older. Greater urbanization leads to stress from overcrowding, pollution and crime, as well as an increase in stresses related to work and family life, all of which contribute to an increased negative effect on consumers’ sleep patterns. Similarly, as consumers grow older, their bodies produce less of the sleep-regulating hormone melatonin, making it harder for later lifers to fall asleep and remain asleep, both of which often cause later lifers to turn to sleep aids for relief. Both the urban and later lifer populations are growing quickly on a global scale at CAGRs of 2.1 percent and 3.3 percent, respectively, over 2012-2017—faster than the world’s population overall, which grew at a CAGR of 1.2 percent. This trend will continue to drive sleep aid sales moving forward. High levels of stress are incredibly damaging to physical and psychological health, and in addition to the use of sleep aids for stress relief, there are indications from other consumer goods categories that consumers are trying to adapt their purchasing habits to their increasingly busy and stressed lives. Globally, products that provide quick boosts of energy or are easy to consume on the go are rising in popularity. For example, global volume sales of reduced-sugar energy drinks grew at a CAGR of 12.1 percent from 2012-2017 versus regular energy drinks at 7.7 percent. Consumers are very aware of how their changing lifestyles are impacting their health, and they are increasingly drawn to products that not only provide health benefits and are natural, but that fit into a busy schedule without adding additional stressors. Much innovation in the field of stress management and sleep aids comes in two forms—natural products and medical devices. Tea positioned as a sleep aid is one of the most successful natural products to enter this space, especially in North America, as tea is well-suited to be incorporated into a consumer’s pre-bedtime relaxation schedule. Pillows are another area of innovation that has rapidly positioned itself as providing improved sleep to consumers. Additionally, with consumers embracing trends in health management that do not include the ingestion of chemicals, the use of sleep-aiding devices is increasing. There are many different kinds of devices to help improve consumers’ ability to both fall asleep and remain asleep as well as improve the quality of the rest they get, including specialized mattresses and white noise machines, among others. Keena Roberts is senior consumer health analyst at Euromonitor International.